The Niger State Police Command has arrested seven staff members of the Central Bank of Nigeria (CBN), Minna Currency Office for diversion of N13 million mutilated currency meant for destruction by burning. 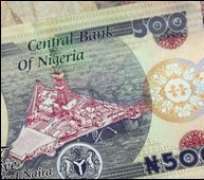 The suspects - Abdul Rahman Idris; Umar Alhaji; Shehu Usman; Alhassan Galadima; Lawal Mohammed; Yerima Usman and Danjuma Bello - were alleged to have been involved in the diversion of the mutilated currency they were detailed to destroy but chose to keep the said money. Investigations by THISDAY revealed that among those arrested by the police in connection with the deal were drivers, messengers and some security men on duty who were alleged to be privy to the deal but failed to report to higher authorities. The suspects were alleged to have shared the money with each of them getting N2.9 million; N2.5 million; N2.4 million; N2.7 million and N2.8 million, while Usman and Bello allegedly received N500,000 and N70,000 respectively. THISDAY gathered that some of the suspects had been in the business of diverting sums of money meant for destruction by burning, by sharing such monies among themselves. The police, who said the suspects had been under surveillance for some time, laid ambush for them during their last trip to the burning exercise. It was gathered that six of the suspects were arrested in a bush after successfully sharing the money among themselves. On interrogation by the police, one of the suspects confessed to the crime and named the seventh suspect, who did not go with them to the bush to share the money, leading to his subsequent apprehension by the police. Huge amounts of money were found in the bank accounts of the suspects by the police, while close to N1 million was found in the residence of a member of the gang who was arrested at home. The command's Police Public Relations Officer (PPRO), Richard Oguche, an Assistant Superintendent of Police, when contacted confirmed the story. He said the suspects would be processed for court on completion of investigations into the matter.